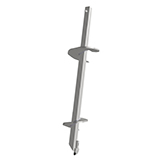 A helical anchor/pile is an extendable deep foundation system with helical bearing plates welded to a central steel shaft. Load is transferred from the shaft to the soil through these bearing plates. Central steel shafts are available in either Type SS (Square Shaft) series or Type RS (Round Shaft) series. 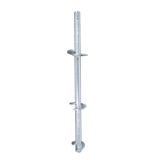 The Type SS series are available in 1-1/4″ to 2-1/4″ square sizes. The Type RS series are available in 2-7/8″ to 4-1/2″ diameter sizes. 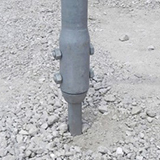 Type SS-RS combinations are also available for compression applications in soil conditions where dense/hard soils must be penetrated with softer/loose soils above the bearing strata. The Helical Pulldown® Micropile series is also used in applications similar to those requiring the use of the Type SS-RS combinations. Segments or sections are joined with bolted couplings. 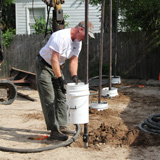 Installation depth is limited only by soil density and practicality based on economics. A helical bearing plate or helix is one pitch of a screw thread. 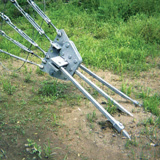 All helices, regardless of their diameter, have a standard 3″ pitch. Being a true helical shape, the helices do not auger into the soil but rather screw into it with minimal soil disturbance. Helical plates are spaced at distances far enough apart that they function independently as individual bearing elements; consequently, the capacity of a particular helix on a helical anchor/pile shaft is not influenced by the helix above or below it.